1: Praise ye the LORD. Praise, O ye servants of the LORD, praise the name of the LORD. 2: Blessed be the name of the LORD from this time forth and for evermore. 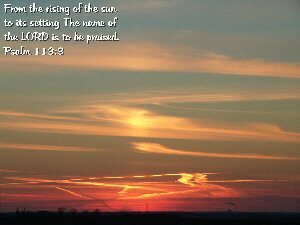 3: From the rising of the sun unto the going down of the same the LORD's name is to be praised. 4: The LORD is high above all nations, and his glory above the heavens. 6: Who humbleth himself to behold the things that are in heaven, and in the earth! 8: That he may set him with princes, even with the princes of his people. 9: He maketh the barren woman to keep house, and to be a joyful mother of children. Praise ye the LORD.